While the website is currently an MVP and very simple, we have plans to expand it. These plans include a set of documentation about how we work. We will experiment with other features as the need arises. The two most requested items with regard to resources were Learning Resources and a Website. These two are linked, but require very different types of work. Since this clearly highlighted the need for a website, we began work on this right away. 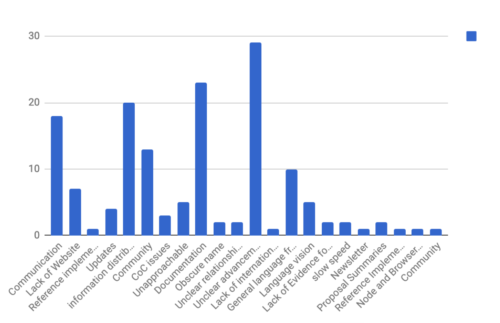 We identified different types of users: Learners who are discovering the specification for the first time, Observers of the specification who are watching proposal advancement, and Reference Users who need a central location where all of the significant documents can be found. The website was designed around these users. In order to not overwhelm people with information, the MVP is specifically focused on the most pertinent information, namely proposals in Stage 3 of our process. Links are contextualized in order to help people understand what documents they are looking at. The website is very simple, but gives us a starting point from which to move forward. We are continuing to work on documenting our process. We hope to make more of these documents publicly available soon and to incorporate them into the website over time. As part of the survey, we collected emails in order to get in touch later, as we were unsure how many responses we would get. The goal was to better understand specific concerns. However, we had an overwhelming amount of feedback that pointed us in the direction we needed to go. After reviewing this, we decided against keeping this personal information and to request feedback publicly on a case-by-case basis. Thank you to everyone who participated. We are looking forward to your feedback and comments. This project was community-driven— thank you to everyone who made it possible! 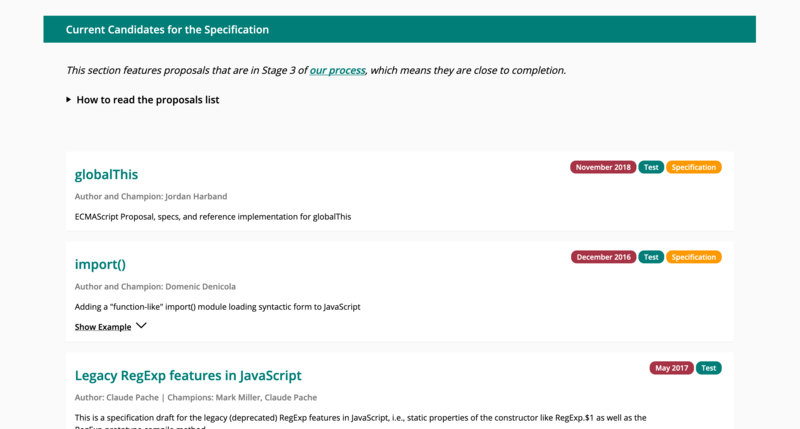 Since the list of Stage 3 proposals is relatively short, it might be worth to enhance it with browser (and Babel) support information. That seems really useful. 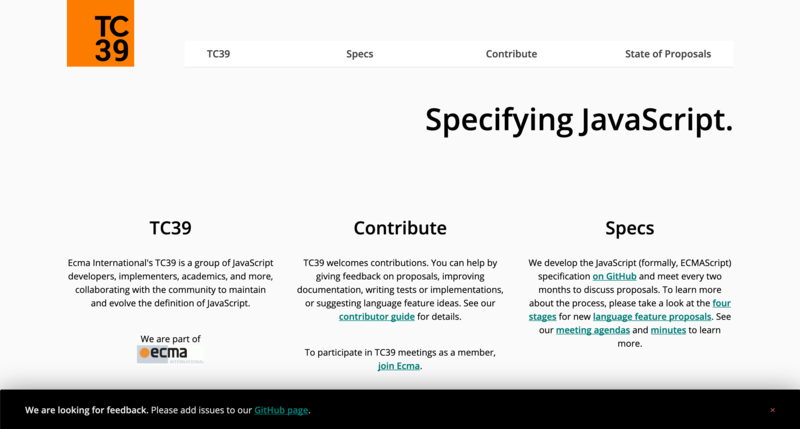 I think the website is a great idea, and I think tc39 has done a great job driving improvements to the language. My sense is that the developer frustration that won’t be helped by a website, “unclear advancement” is related to a perception in the community that their feedback isn’t impacting the decision making process. If you look at the history of the private sigil #, for example, it has been very controversial from the start. Amidst the active discussion, it was combined with the popular and highly desired public class properties spec. This felt to some like slipping a lemon into a funding bill (or some better analogy). 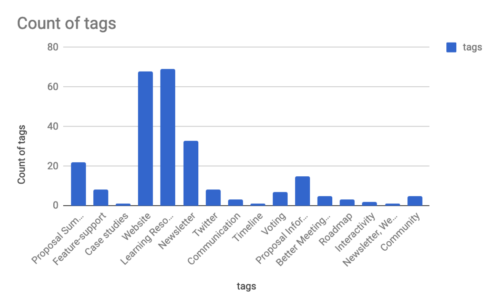 After this, and voluminous feedback from the community asking for alternate solutions, the proposal continues to advance, mostly it appears due to the sponsorship of a couple people. There are good technical reasons for why that is, however the point remains that the community (other than a subset of library authors) spoke pretty loudly and clearly on the subject, but it wasn’t visible what, if any, impact that had. I know there has been several issues similar to this, I’m just cherry picking that one because I participated in the discussion. My sense is that to help alleviate the “unclear advancement” issue, the developer community needs to feel like decisions are being made with us, not for us. While I’m a huge supporter of wasm and the brilliant technical and political accomplishment that it represents, it also makes me concerned about the future of js. For the first time, very soon, js is going to lose its “regulatory capture” status and be forced to compete directly with other languages. I feel like the only way to survive that and thrive is to win hearts and minds. I think that starts with having a more clear community involvement with the language direction.